A series of violent incidents broke out at Eastside High School in November, according to 39 pages worth of police reports reviewed by the Paterson Times. There were eight serious incidents ranging from a student threatening to “pop” the “lid off” the school’s principal to students attempting to attack a police officer. James Smith, head of security at the Paterson Public Schools, recognized an “uptick” in fights in November. He disputed one incident as having not occurred on school grounds and found fault with details of two others. Students involved received suspension and in some cases counseling. “We just don’t suspend people. We give them positive peer culture too,” said Smith. He said there’s a team of adults at the school who speak to the students and provide them positive role models. Students are able to sit and discuss problems with the adults, he said. Smith also pointed out the location of the high school in a high crime area also presents an unique set of challenges. School board member Flavio Rivera said sometimes students bring in issues from outside of the school into the building. He said the measures like having security booths at the entrances to school grounds has helped to deter some of the street influence that was filtering into the building. He also said the gatherings outside of the school has been minimized in recent years. Rivera’s initial response, when provided brief descriptions of the eight incidents, was “Wow.” School board member Emanuel Capers suggested the school should teach students to solve problems without resorting to violence. Some suggest the change in administration at Eastside High School may be a culprit. Former principal of operations Zatiti Moody, who has received praise for establishing order at Eastside High School during his tenure, was moved from Eastside High School to the Great Falls Academy in the 2017-18 school year. Smith and Capers dismissed suggestions the uptick may have to do with change in administration. “It’s not the administration. These kinds of problems would have happened with any principal,” said Capers. Smith said the school has adequate security staff in place. “If we feel it’s starting to get out of control, we’ll add more personnel,” he said. “We have a good security staff on board,” added Rivera. On Nov. 3, 2017, a fight broke out between two girls at the Park Avenue entrance to the high school at dismissal time. A security officer and an off-duty police officer intervened and separated the girls. English grabbed his radio and sought assistance from headquarters. He attempted to secure the student in handcuffs, but felt someone grab his gun. “Students didn’t grab his gun,” said Smith. He said the students grabbed his handcuffs and his radio. English, an 11-year police veteran, saw two students screaming at him and telling the crowd to “f– him up.” He let the student go. She fled on foot towards Rosa Parks Boulevard. English followed the student on Rosa Parks Boulevard and placed her under arrest by a laundromat. He also had back up officers arrest a second student. A third student also fled towards Rosa Parks Boulevard. English located the third student and tried to arrest him, but he began resisting by flailing his arms. English was assisted by sergeant Kelly Pacelli in placing the student under arrest. A fourth student was arrested. This student was later released. English was not able to positively identify this individual as one of those involved, according to the police reports. On Nov. 7, 2017, a mother filed a report stating her daughter was attacked by another student. School officials gave in-school suspension to both girls following the fight. The mother claimed her daughter did not start the incident. The mother filed the report on Nov. 13, 2017. She told police the incident happened inside the school. Smith, disputing the incident, said it did not happen at the school. On Nov. 7, 2017, a fight broke out between two students in room 123. A student bumped into another resulting in a fight. The police report states the two students had a previous fight earlier in the year. On Nov. 14, 2017, a student was attacked by another. His mother filed a police report the next day. The boy suffered swelling and bruising to the forehead and left eye. The victim told another boy to stop talking. At which point, the second boy told him, “What are you going to do about it.” He then began striking the victim in the head and face, according to police reports. The victim fell to the ground hitting his forehead on a computer table. School officials immediately suspended the aggressing student, according to the reports. On Nov. 14, 2017, a student allegedly struck another on the head with an “unknown object” in the gym locker room. The boy fell to the ground. “He is unsure if he lost consciousness and that he remembers hearing his name when he sat up from the ground,” reads the police report. The victim was not sure whether he was struck with an object or by the other student’s fist, says the report. Smith said the student was struck by the other student’s fist and not an object. The fight was over a “gaming controller,” according to police. The victim was taken to St. Joseph’s Regional Medical Center. Police report states the aggressing student was suspended from school. On Nov. 22, 2017, police arrested three boys for allegedly assaulting a staff member at the gymnasium. There were videos of the incidents that surfaced on social media purporting to show a staff member attacking the students. 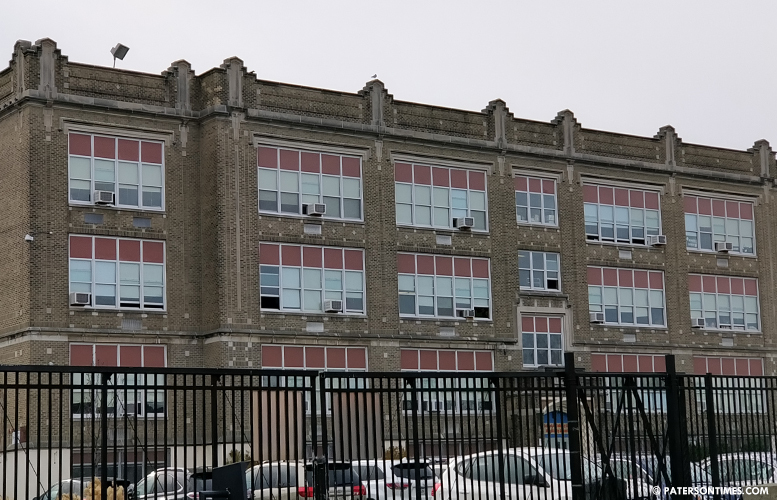 Surveillance footage of the incident reviewed by the Paterson Times at the district office on Wednesday morning showed a group of students gathering in the corner of the gym. Suddenly, a fight breaks out. One of the two bass drums that were in the gym falls to the ground. Police report of the incident says three of the students attacked an instructional aide, Ronnie Austin. School officials said a staff member told the students to take seats when the three began striking Austin. Video shows staff members physically intervening to prevent a boy from running from the scene. On Nov. 27, 2017, police responded to report of boy who had threatened to shoot a girl and her son. Police charged the boy with four drug offenses and two terroristic threats to kill. The youngster may not have had enough street experience to realize Pennington Street would struggle and fail to make it on a list with violent streets like Rosa Parks Boulevard, Governor Street, and Godwin Avenue. On Nov. 27, 2017, a student followed another to a table at the cafeteria. The aggressing student began confronting the victim. At one point the aggressing boy strikes the victim. Both engage in a fight. A school staff member, Austin, pulls the aggressing student to break up the fight. A selective video footage of the incident which only shows a staff member pulling the student surfaced on social media alleging the school staff rough handled the student. The doctored video appears to provide a false narrative. Video of the incident reviewed by the Paterson Times on Wednesday morning shows the staff member breaking up the violent incident. The aggressing student was suspended for five days.